1. Temporary spare wheel locking ring. 2. Temporary spare wheel retaining bolt. 3. Tool kit retaining bolt. After use, the tool kit should be returned to the under floor storage area and correctly stowed. The spare wheel is heavy and if handled incorrectly may cause injury. Use extreme caution when lifting or manoeuvring the wheels. 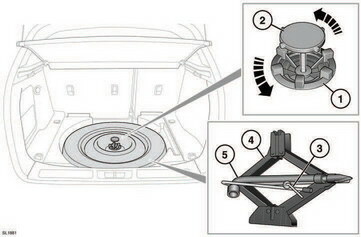 Always secure the spare wheel, or the removed wheel, in the correct position using the retaining bolt. Always remove the temporary spare wheel before jacking the vehicle. Note: Examine the jack occasionally, clean and grease the moving parts, particularly the screw thread, to prevent corrosion.